In this “Homestead Proof,” one A.J. Sheldon, a fellow farmer, swore that Wilder was a citizen of the United States and had never tried to claim a homestead in the past. Sheldon could testify that Wilder’s home was 12 feet square, with two doors and three windows. Wilder had been absent at times for work on the railroad and to visit Minnesota, but he had nonetheless cultivated crops on the land for four years straight. The plot contained no coal or other valuable minerals. The clerk of the Homestead office certified that Sheldon was a “person of respectability” and fit to serve as a witness. Having claimed his land, Wilder married Laura in 1885. Laura didn’t write the main group of Little House books, which told the tale of her childhood on the frontier, until the 1930s; her busy life as a farm wife wouldn’t allow it. The story of Laura and Almanzo’s time on the Dakota homestead—a happy period, albeit fraught with disease and crop failure—can be found in Laura’s posthumously published novel The First Four Years. 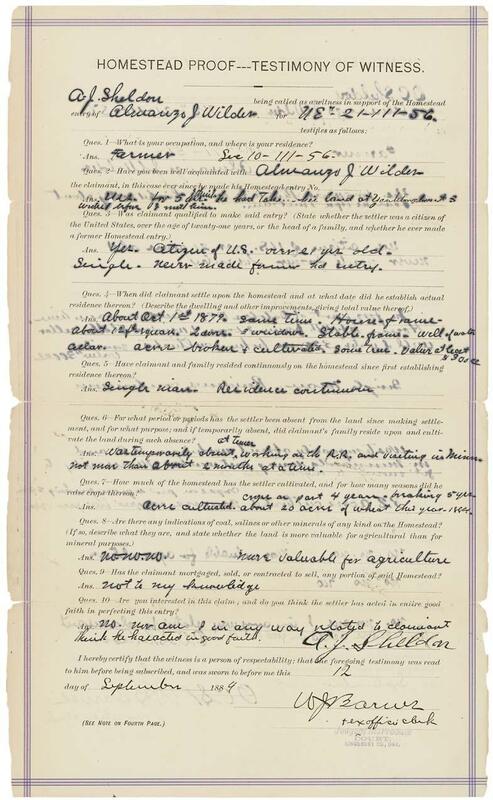 Homestead Proof Testimony of Almanzo Wilder, 09/12/1884. National Archives, ARC Identifier 595419.